After seeing Barbara (2012) at the RBC Dumfries I thought a revisit to another German film set around the same timespan would not be out of order. Although I have seen The Lives of Others (2006) quite a few times, twice at the cinema plus a couple of times on DVD I still find that viewing this award winning movie a very emotional experience. For those of you that have never seen this film, I doubt that will be many, I will give you a short synopsis. The film opens with a written statement informing us its 1984, we are in East Berlin and Glasnost is nowhere in sight. The population of the German Democratic Republic is kept under strict control by the East German Secret Police (the Stasi) Its force of 100000 employees and 200000 informers safeguard the Dictatorship of the Proletariat. Its declared goal is to know everything. To this end Captain Gerd Wiesler (Ulrich Muhe) a hard-line Stasi officer is engaged in the surveillance of an author/playwright Georg Dreyman (Sebastian Koch) and his beautiful actress girlfriend Christa-Maria Sieland (Martina Gedeck) But unbeknown to Wiesler its not for political reasons that he has been asked to spy on the loyal socialist Dreyman but more to do with removing him on some jumped up charge so that the East German Culture Minister Bruno Hempf can have the beautiful actress Christa-Maria all to him self. 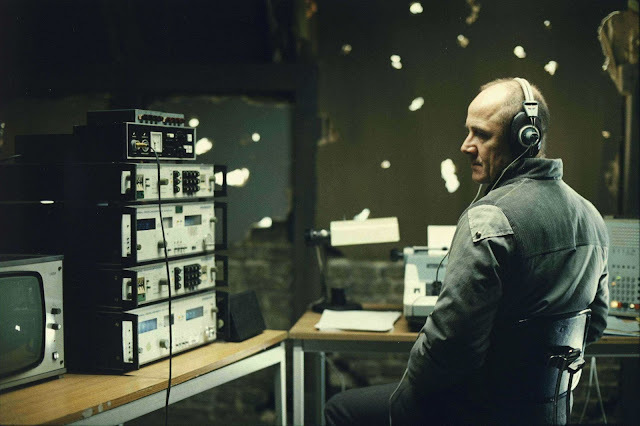 Wiesler is a sad and lonely man, with no friends and no life outside of his work so when he begins to gather information during the surveillance of the academic couple he realises that there is a life beyond his bleak existence and he begins to form a bond with two people he does not know. This in turn makes him question the morality of his job and politics. ...........Dreyman and Christa-Maria have no idea whats happening in their loft area! The strength of this movie is in its powerful script written by the film’s director Florian Henckel von Donnersmarck (The Tourist 2011) who carried out extensive research by interviewing both the people that worked for the regime and those most effected by it. Machines and equipment that were actually used by the Secret Police along with genuine street locations, clothes and cars gave the film a great sense of authenticity. A wonderfully convincing performance from the complete cast with Ulrich Muhe’s part as Wiesler allegedly mirroring his own life! After German reunification he discovered evidence in his Stasi file that he had been under surveillance not only by four of his fellow actors but also by his wife who was registered as an ‘unofficial collaborator’ although she denied it. Muhe subsequently died of stomach cancer in 2007. It was the Lebanese composer Gabriel Yared, who won an Oscar for Best Original Score for The English Patient (1996), who composed the haunting Sonata for a Good Man that plays such a significant part in von Donnersmarck film. Incidentally Sebastian Koch, who could not play the piano, practiced for four hours a day for six weeks so that he could actually perform this music. This is an intensely enjoyable piece of cinema that reveals the mechanism of dictatorship by showing as clearly as possible human destinies from the perspective of a man that worked for the secret police, unusually, for German film, depicting him as a human-being rather than a clog in the state wheel.